ECOLOGIQ is a company manufacturing prefabricated, eco-friendly and energy-efficient houses for individual customers and developers. We also produce large structures for healthcare, education and commerce. 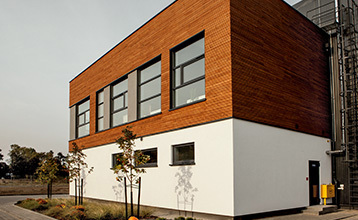 Modern, light timber structures are the basis of our energy-efficient technology. They are characterised by excellent thermal parameters, high strength and rigidity that enable the construction of multi-storey buildings. Advanced prefabrication technology combined with the unique abilities of highly skilled workforce guarantee timely execution and short lead times. Clients receive a building in a shell and core condition, with a high standard of execution and premium class quality. Our modern prefabricated houses and energy-efficient public utility buildings are characterised by low operation costs and a healthy, eco-friendly microclimate of the interior. The structural elements of our buildings are produced using cutting edge wood processing machines, i.e. 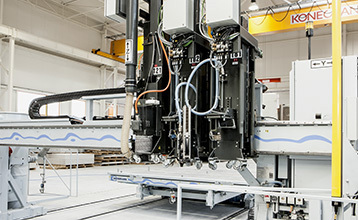 the Hundegger’s CNC woodworking machine and Weinmann’s production line. Prefabricates are manufactured with 1 mm accuracy, based on the KVH solid timber and LVL laminated layered timber. Due to their exceptional characteristics, the materials do not crack or warp, and are resistant to damage, fungi and insects. Factory of energy-efficient houses in Gdańsk. CNC woodworking centre by Hundegger. 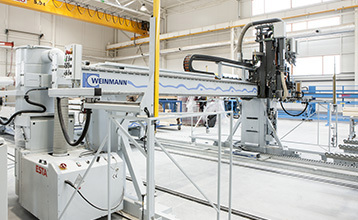 State-of-the-art production line by Weinmann.